BonTon Style | virtual runway: Armani Acqua for Life. 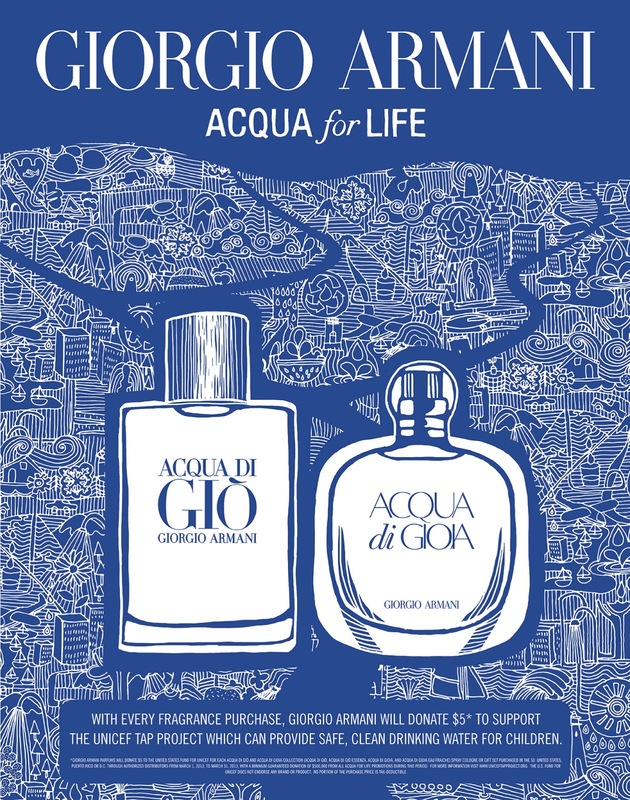 During March, with every Acqua di Gio, Acqua di Gioia, Essenza and Acqua di Gioia Eau Fraiche fragrance spray or qualifying set purchase, Giorgio Armani will donate $5 to support the UNICEF TAP Project which can provide safe, clean drinking water for children who need it. The UNICEF Tap Project is a nationwide campaign that provides clean water and adequate sanitation to children around the world. With just $5, UNICEF can give one child safe drinking water for 200 days. Currently, UNICEF works in more than 100 countries around the world to improve access to safe water and sanitation facilities in schools and communities and to promote safe hygiene practices. Since 1990, thanks to the work of UNICEF and its partners, more than 2 billion people have gained access to clean drinking water.